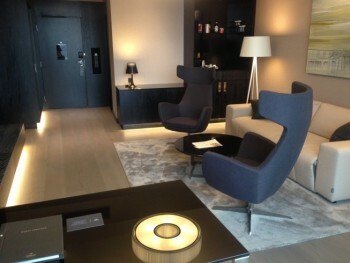 This is my review of the new Hilton Tallinn Park hotel in Tallinn, Estonia. It is part of our occasional series of ‘new luxury hotels in European tourist spots where you might want to use your hotel status benefits or redeem points‘! Earning miles and points is, after all, only half of the equation. If you haven’t been to Tallinn, I highly recommend putting Estonia’s capital on your list of ‘cities I need to visit’. Tallinn was founded in 1248 and became a major trade hub especially between the 14th and 16th century thanks to its location on the shore of the Gulf of Finland. Today Tallinn is known as the Silicon Valley of Europe, being the birthplace of many international companies including Skype. At the same time, Tallinn’s old town is one of the best preserved medieval cities in Europe with gorgeous houses and an impressive city wall. This makes the city a great destination for a short break. 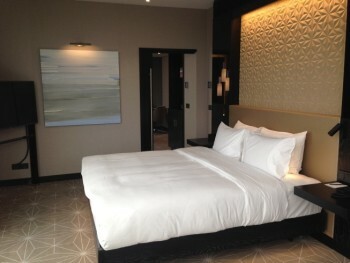 To promote the opening of the Hilton Tallinn Park, Hilton provided me with two complimentary nights, free breakfast and lunch, one dinner and a spa treatment. Head for Points paid for the flights, ferry, transport and all other expenses. 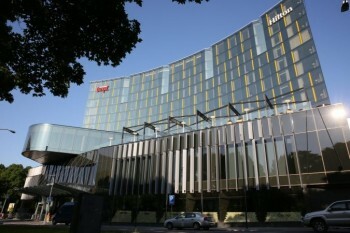 The Hilton Tallinn Park is located on the edge of Politseiaed Park between the city’s business district and the old town. It was built on the site of the former Park Hotel. You can easily walk into the old town (15 minutes) or take a taxi for around €5. 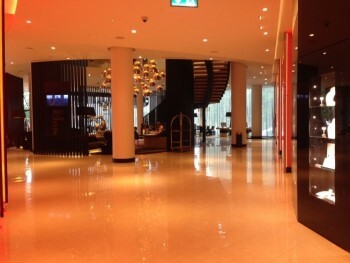 Hilton Tallinn Park is very accessible with both Tallinn airport and the harbour being about a 10 minute taxi ride away (~€8). To find out about how to get to Tallinn using Avios, you can read the article about my journey here. As you can see the bar is the centrepiece of the lobby with wooden cut out wall panels and white pillars creating a separation from the reception area. As the room was a corner room with floor to ceiling windows, you had a great view over the park on one side and a residential area and further down the harbour on the other. 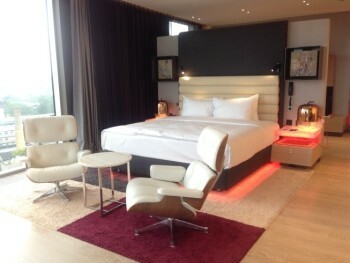 The bed was a very comfortable king size with two bedside tables and each one had a European socket and a night lamp. 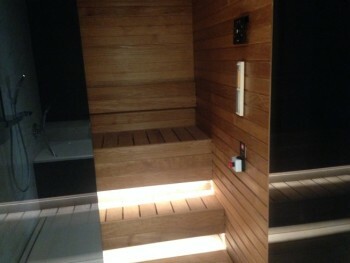 This image shows the room in between the bathroom and the bedroom with a wardrobe which also houses the safe. 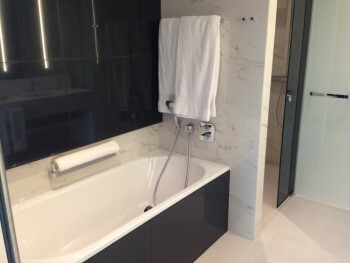 The bathroom was a good size with a bathtub and a separate shower. 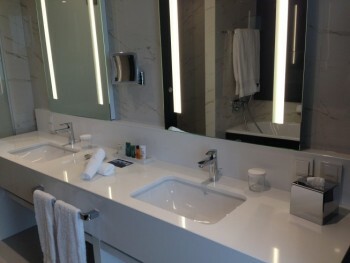 The two sinks had lots of space for wash bag, make-up and co. 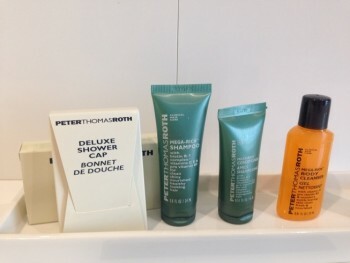 I really liked the Hilton-standard Peter Thomas Roth toiletries. In addition to the usual shampoo, conditioner, shower gel, body lotion and soap bar there was also a massage body bar. 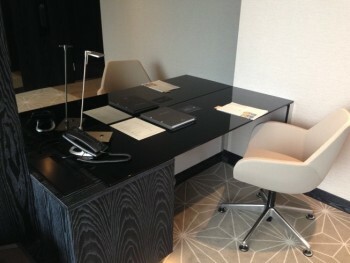 The desk was a great size, perfect for working and had two European, one UK and two USB sockets. Unfortunately the UK socket was the wrong way round for my laptop charger, but luckily I brought my adapter. The chair was comfortable and thanks to the large windows the room was bright enough to work during the day without having to turn the lights on. The hotel provides free standard wifi for all guests and faster premium access for Hilton HHonors members. On this image of the living room you can see the wardrobe (which has an ironing board with iron and two umbrellas in it). Next to the wardrobe on the left is the front door. 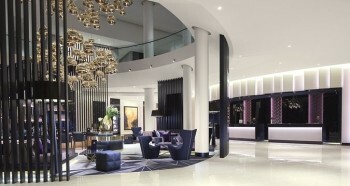 The Hilton Tallin Park has 202 guest rooms and 27 suites. 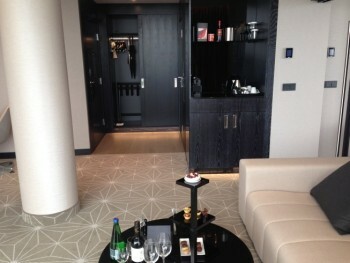 As I was staying in a suite (which we didn’t request! ), I asked to take a look at the standard rooms where you would usually end up in staying on business or redeeming Hilton HHonors points. 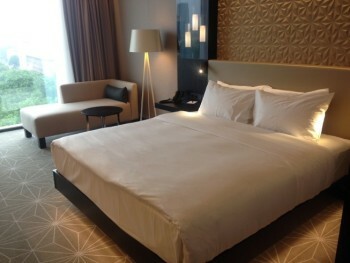 This room comes with a Kingsize bed. The sofa and desk are in the same room, but it doesn’t feel cramped. 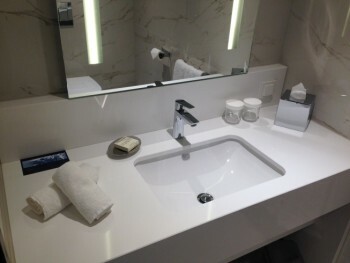 The bathroom was very similar to the one in my room. Same room as above except for the beds which are two double beds. Similar to the Deluxe rooms but as these rooms are corner rooms, there is more natural light coming through the large windows. 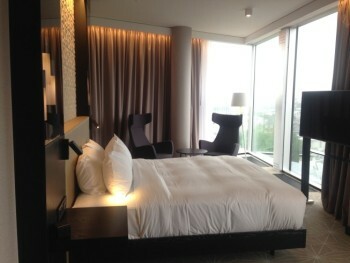 All in all I was very impressed by the hotel design and amenities. As it has just opened, the hotel is good value for money at the moment. For the weekend of 19th-21st August, for example, a Deluxe Room with View is €129 per night. 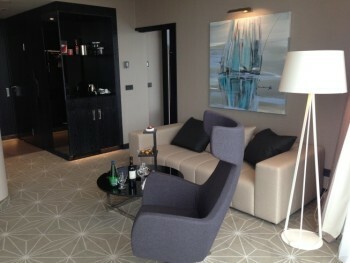 The suite I had is only €192 and that comes with Executive Lounge access (see Part 2). If you use points a standard room is 30,000 Hilton HHonors points per night which, using Rob’s 0.3p per point valuation, is not a bad deal. 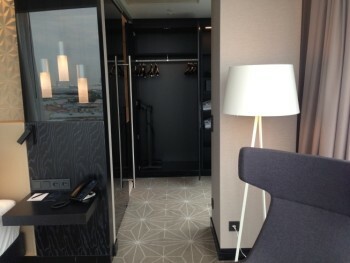 In part two of our review of Hilton Tallinn Park I will look at the executive lounge, the spa and restaurant – click here to read it. How many Nespresso pods did you get? Last time I stayed in a deluxe king room, I got 3. It was fine for me, but if I’d been with anyone else, we would have been fighting over who got a second cuppa. 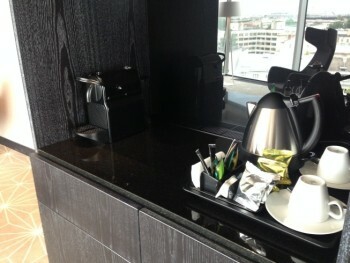 Room service will give you refills any time you ask – I’ve never been charged for extra pods. Good review. 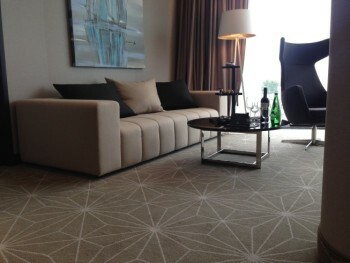 Swissotel in town is very good, so this review is a good comparator.